The finale in the Hourglass trilogy, Infinityglass boils the troubles and chaos that’s been going on down to a rushed simple solution. As of the previous books’ patterns, Infinityglass also shows two different POV characters, Dune and Hallie (Teague’s daughter.) The dire situation with the Hourglass cooperation changes when information shows that the infamous Infinityglass is not an object, but a person involved with Chronos. How will the crew go about retrieving this person and what exactly is the Infinityglass doing to the rip world? Time will tell. 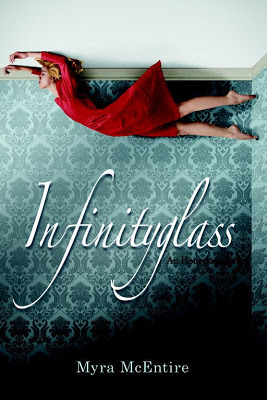 With how much I loved Hourglass and Timepiece, I must say I was a little disappointed with how Infinityglass came about. It felt rushed and the main plot of the trilogy got completely lost until the very end. Be forewarned, this book delves more into a silly romance than anything else. Forget the action and adventure that the hourglass crew were involved with in the first two books, this is all about Dune and Hallie and their instalove for each other. There are some high points of the book. We get to learn more about Dune, his powers and why he’s troubled with them, and we learn exactly what the Infinityglass is, and what it does (sort of.) I’m still a little confused on that whole concept, as I’m not sure what the whole problem with the rips and their use of the infinityglass entailed. I wasn’t all that enthused with Hallie’s character, but I suppose it adds variety to the series. The book just felt out of place in the trilogy, rushed and incomplete; it’s like forcing pieces that do not fit into a puzzle. There was far too much romance for my liking (as I felt it had nothing to do with the main plot of the book,) the book waned in and out of interest and the ending was basically resolved in one chapter. I’m sorry to say that although I was very enthused with the first two books, this finale fell a little too flat.